DNG Maxwell Heaslip & Leonard is offering to the market a stunning luxury ready-to-occupy detached residence in the much sought after area of Furbo. 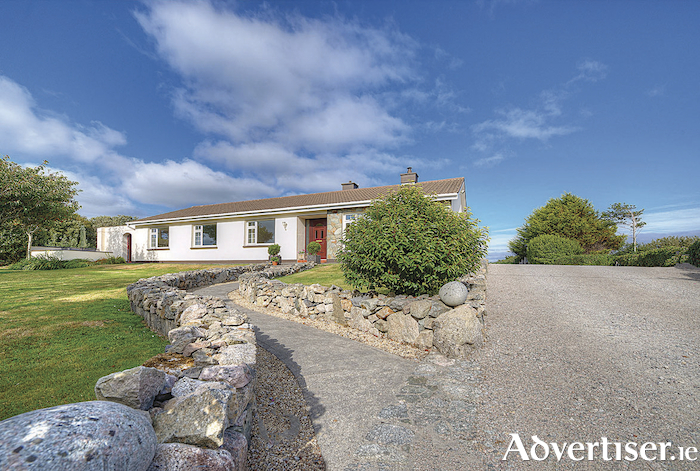 Sitting on a raised 0.76 acre site and close to local primary schools, beaches and only 14km to Galway city, this home offers the new owners privacy and convenience with easy access to all amenities. This is a fully fitted residence with the highest quality finish throughout including a large front garden, sea views, a large garage that stretches from the front of the house to the rear, two living rooms and four double bedrooms. Each of the rooms is bright, spacious, and very well proportioned. The garden to the side and rear are not overlooked and have beautiful panoramic views. There is a secure paved drive and parking area to the front and rear of the house. Accommodation includes a wide entrance hall with carpet floors and access to the living room, kitchen, and all bedrooms. The kitchen has a tiled floor, built-in kitchen units, a rear window overlooking the back yard, and access to the second living room. The main living room leads into the dining room and on to the kitchen, both with magnificent sea views. There are four double bedrooms, with the master having an en suite and a fully tiled guest wc and separate bathroom. DNG Maxwell Heaslip & Leonard is quoting an asking price of €425,000. For full particulars or to arrange a viewing, contact the sales team at 091 565261.